The course at Ottawa’s Carleton University, which is being accused of bias, was taught for four terms from 2009-2011 by Tom Harris, a featured expert at the Heartland Institute. 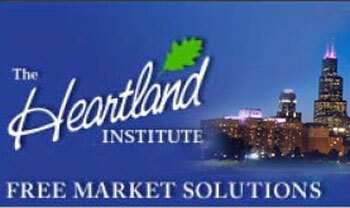 Heartland’s core mission is to discredit climate change, and it is currently moving into the education realm. It plans to spend $100,000 on a project countering established teaching of climate change to American school children, an unauthorised release of documents showed. But the audit report, released on Tuesday, suggests such efforts are already underway on college campuses. A team of scientists, who reviewed the videotapes of Harris’s lectures provided by the university, found 142 false, biased and misleading claims. The course, which is not intended for science majors, may for many students be the only academic exposure they have to climate change while earning their undergraduate degree. The report found the course under Harris’s direction systematically deviated from the scientific mainstream on climate change, embracing extreme opinion. Carleton, in its response, suggested that Harris’s choice of teaching material was an issue of academic freedom. It also noted that the course is not currently being offered as part of the usual rotation of academic offerings. The head of the earth sciences department, Tim Patterson, did not respond to requests for comment. Harris, a mechanic engineer by training who has also done PR for the electrical and gas industries, said the authors of the report were not qualified to critique his course. He also said most of the material was provided by Patterson. “95% of my course material was his stuff,” Harris said. However, he acknowledged that he did not accept that human activity was the main driver of climate change, as well as a connection to the Heartland Institute. Harris would not comment in a telephone call and email exchanges on his renumeration from Heartland or the sources of funding of his own organisation, the International Climate Science Coalition. Some of the false or misleading material singled out by the Cass review are classic talking points among those who dismiss the existence of man-made climate change. They include lines like: “The only constant about climate is change” and “carbon dioxide is plant food”. Other points are just plain wrong, like Harris’s assertion that there is only one weather station in the Canadian Arctic – when there are more than 40, that the Amazon jungle is a relatively new formation, in geological terms, or that urban weather stations do not show consistent warming. Harris in his lectures also ventured into hyperbole, saying of the weather-caster and prominent climate doubter blogger Anthony Watts, that he “deserves a Nobel prize or a prize of some sort”. The report, coming on the heels of the revelations about Heartland, offers further evidence that the misinformation campaign against climate change is becoming more entrenched in the academic arena. This entry was posted in Climate Change and tagged Deniers. Bookmark the permalink.